ORGANIC 316｜ORGANIC COTTON｜IKEUCHI ORGANIC Inc. Thick and fluffy. Using high density yarn creates a towel of generous volume and an almost springy touch. It is amazing how the character of a towel changes depending on the yarn. Several hundred combinations of thread were tested to achieve the perfect amount of volume for this towel. Organic 316 towels provide the kind of luxurious weight you would expect to find in classy European hotels. The sumptuous touch of thick cotton gently envelops your wet body. The soft texture of organic cotton does not get soggy after swiftly soaking the water away. You will want to keep it draped over your shoulders forever. The elaborately woven pile forms a layer of air that gives a warm sensation fitting for a blanket. 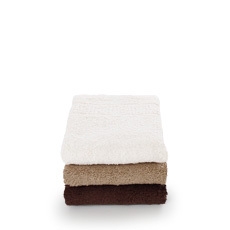 A delightfully luxurious towel that has been chosen for luxury hotel suites. After wiping your body, hang your bath towel up on a hook with one hand. All IKEUCHI ORGANIC towels large and small have a yellow loop label sewn on. This handy loop is the mark of IKEUCHI ORGANIC. 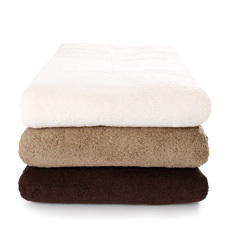 A high volume towel with thick pile that is luxuriously fluffy.